Yesterday we talked about habit routines and some ways to change a bad habit into a good one. 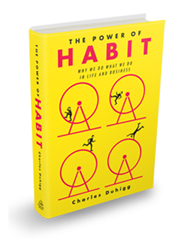 We found that the golden rule of habit change was to keep the old cue, and the old reward, but change the routine. 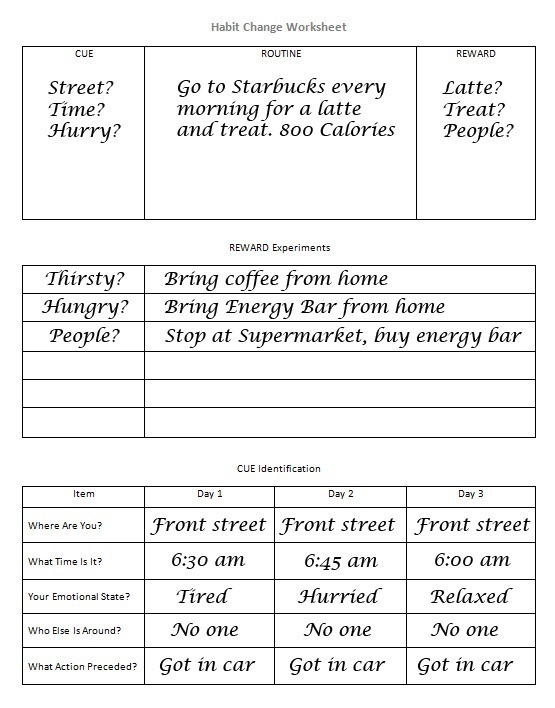 I decided to come up with a habit change worksheet, to list out a bad habit and explore what the cues are and also the rewards. once we have those listed we can change the routine and hopefully the habit. For an example, I chose a habit I used to have when Starbucks first opened in my area. Everyday I would drive by Starbucks on my way to work, and invariably I would pull in and order a latte and a treat to go. This was fine until I realized that the latte was 400 calories and the treat an additional 400 calories. It didn’t take long for those 800 calories to start showing up around my waist. 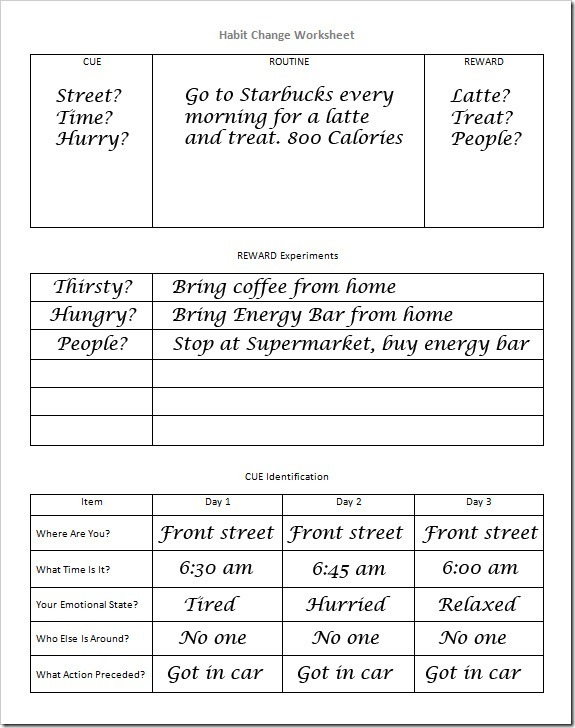 So to figure out the bad habit and look for solutions I put together this sheet. As you can see, the top area has a place to list our current routine and also list out possible cues and rewards, while the middle has a place for our reward experiments. The bottom area allows us to mark down our 5 possible trigger areas when we are cued to start the routine. 1. In the top area write down the current routine, and list possible cues and rewards. 2. Experiment with rewards and note the actions you took. 3. Write down the answers to the five questions when the cue is activated. In my experience with this habit it turned out that the cue was driving by Starbucks. Just seeing the sign triggered the habit. Filling out the form confirmed this. Every time I drove down front street and saw the Starbucks sign, the craving was activated. As far as the reward area, in doing multiple tests it turned out that I was seeking multiple things. I found that I was hungry and thirsty. When I brought a coffee from home, I still wanted to stop at Starbucks for a treat. When I brought the energy bar, I still craved the latte. Solution: To successfully change this habit I had to do three things. I started bringing coffee and a healthy breakfast sandwich with me from home. This cut out over 500 sugar calories a day. The secret to making it successful was to alternate the way I drove to work, so that I didn’t pass the local Starbucks on the way to the freeway and not be tempted to stop in. 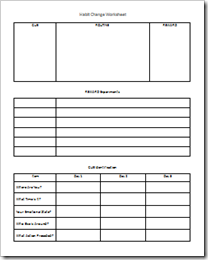 Application: I’ve created a blank Habit Change Worksheet as a free download. It’s in MS Word format and also in PDF format. You can download it here. Question: What habits do you want to change? Our Personal Success Articles provide simple answers for achieving success with tutorials, templates, and helpful techniques.